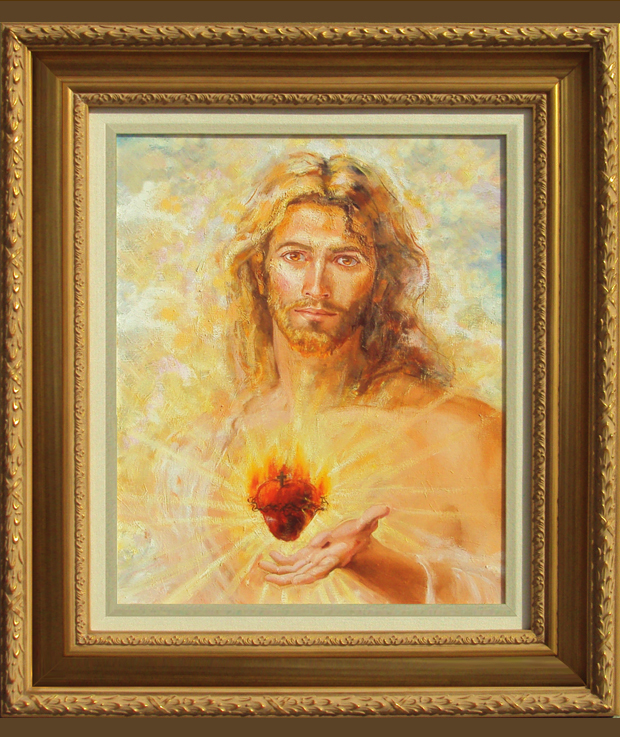 In 1993 Joseph Fanelli, well known and classically trained Portrait and Floral Still Life painter was asked by his Mother to paint "The Sacred Heart of Jesus" for her chapel. Ten years later, the magnificent image Mr. Fanelli created has become one of the most sought after, revered images of the apparition of The Sacred Heart as well as of Jesus in general . Prints of the piece have been blessed by The Holy Father , John Paul the Second, churches all over the world have used reproductions of the image, parishes have prayer groups using the print and most notably, a church in South Florida received permission to translate the image into an 18 ft by 30 ft mosaic for behind the altar. A traditional portrait artist, Mr. Fanelli now receives daily letters , emails , expressions of gratitude and requests for fine prints of the divine image. In a style unique to his art, Mr. Fanelli has captured the iridescent light of an apparition. Moreover, time and time again , viewers have expressed wonderment at the eyes of The Savior and the eternal love captured in them. The unfurling hand beckons the viewer into the embrace of The Savior's all loving heart. Now, finally, Mr. Fanelli has addressed the rising demand for this beloved image by offering Artist Approved Prints, both giclee on stretched canvas and offset paper prints, directly to the public. The quality of the prints' color, clarity and permanence is, for the first time, overseen by the artist's studio.